Solid rosewood back and sides and V-class bracing for a new level of player experience. Indian rosewood is one of the most popular and musically expressive tonewoods in the world. Among Taylor’s solid-wood guitars, rosewood is normally reserved for the 700, 800 and 900 Series, but the 400 Rosewoods bring rosewood - with lustrous gloss finishes - into a more accessible price range. 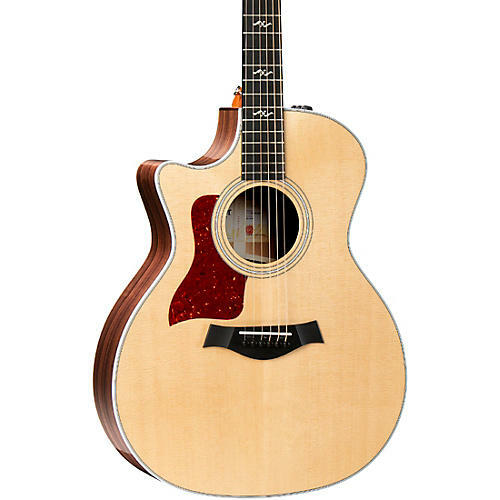 Taylor's Grand Auditorium shape and rosewood's balanced, broad sonic range and complexity - and of course Taylor's renown playability - result in a guitar that will be a joy to play in a variety of scenarios for a lifetime. All 400 Series instruments ship in a deluxe hard shell case made by Taylor for optimal fit and protection.